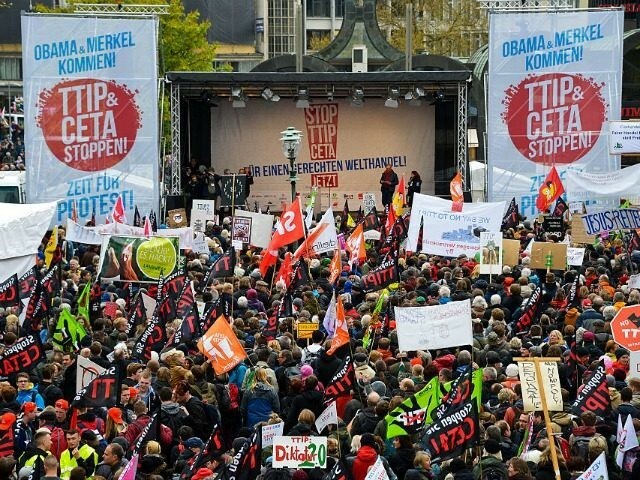 REVEALED: EU To Bypass National Parliaments On Controversial TTIP Deal. The European Union (EU) plans to bypass national parliaments to implement controversial “free trade” deals, sources have revealed. A leaked letter to the EU’s trade commissioner reveals the Italian government supports blocking democracy on CETA, the “little sister” of the widely opposed TTIP deal. A report in the Frankfurter Allgemeine Zeitung alleges the European Commission intends to treat the Comprehensive Economic and Trade Agreement (CETA) deal with Canada as an “EU only” matter. Sources close to the EU trade commissioner, Cecilia Malmström, reveal the Commission will submit the proposal to bypass national parliaments in July. The involvement of national governments in having a say on CETA and the Transatlantic Trade and Investment Partnership (TTIP) has been a key issue in the debate. In May, elected politicians in EU countries stated that both deals would be “mixed agreements”, meaning national governments would have to consent. A leaked letter from an Italian minister to Ms. Malmström appears to confirm that the Commission intends to bypass parliaments. It states that the Italian government “is ready to consider to support the Commission on the ‘EU only’ nature” of CETA. In doing so, it backs blocking a democratic vote for 500 million Europeans. Unlike historic trade agreements, which reduced tariffs on imports, CETA and TTIP will see countries cede sovereignty to multinational corporations. As well as lowering regulatory standards on everything from labour to foods and chemicals, the agreements will also allow companies to sue governments over policies that reduce their profits. In a blow to democracy, they will also bar countries from renationalising services and industries. TTIP is the best known of these new trade deals and is widely opposed. Only 18 per cent of Americans and 17 per cent of Germans support it, down from 53 per cent and 55 per cent two years ago. More than 3 million Europeans have signed a petition opposing the deal, the continent’s most signed ever. CETA has already been signed by both the European Commission and the Canadian government and contains everything campaigners fear about TTIP. It is widely thought once CETA has been ratified, TTIP will have a “dry run” to become law.